While having naturally fast reflexes that are attuned to the way that makes you the envy of your friends when it comes to computer gaming, sometimes natural talent can only bring you so far – especially when you’re going head-to-head with someone else who is also equally talented as you are. Well, what then, becomes the determining factor between winning and losing? Surely this is where the right kind of hardware comes into play, and Speedlink intends to have your ears covered with their very own XANTHOS Stereo Console Gaming Headset. This particular universal sound solution was not developed to cater to just a single gaming platform – no sir, this particularly stylish stereo headset will be able to cater to three different gaming platforms – namely, the Xbox 360, its close cousin the PC, as well as the other console, the Sony PS3. I guess with Wii owners moving up and about, a wired headset is not really advisable in the vicinity, swinging controllers and all. 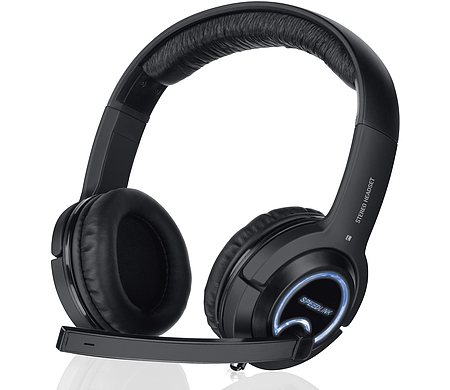 Sporting atmospheric LED lighting, the XANTHOS Stereo Console Gaming Headset will be able to deliver sensational stereo sound on the PS3, Xbox 360 and PC. Not only that, it will enable gamers to hold voice-chats with teammates as well as immerse themselves in the gaming sound on their respective consoles, letting you enjoy ear busting audio in maximum clarity without having to disturb anyone around. I guess this is suitable for those who love playing games late into the night – the XANTHOS Stereo Console Gaming Headset will almost certainly be able to deliver, and do so rather well. Not only that, you can simultaneously play-back gaming sound on the headset and over the TVs speakers, now how about that for an added touch of convenience? The XANTHOS Stereo Console Gaming Headset will ship with a three-metre cable for you to recline fully without being limited by a tugging cable, making it ideal for watching movies as well. Nice to know it does not come with a bank breaking price point, burning a mere 49.99 (pin)hole in your wallet. Stereo is so 1990 gtfo only kids thats still receive gifts get poop like this and only old pedos buy poo like this.